Czech Republic truck manufacturer Tatra a.s. is set to investigate the potential market for factory-built international rally-raid and rally assistance FIA category T4 and T5 vehicles. 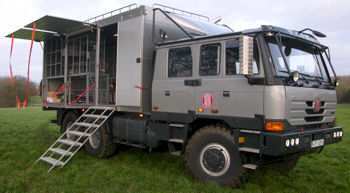 To gauge response, it has supplied Bowler Off-Road Ltd, the UK designers and builders of the Range Rover Sport based Nemesis competition vehicle, with a Tatra prototype T5 class support truck for use on the 2008 Paris-Dakar rally-raid event run from Lisbon this month. Tatra has long been a support vehicle of choice for rally-raid and marathon competitors and Tatra has won the T4 race category six times on the Dakar with numerous truck class wins in the hands of experienced Czech drivers Karel Loprais, Aleš Loprais and Tomáš Tomeček. The modified Tatra Terrno 4-seat crew-cab 6 x 6 all-wheel drive concept supplied to Bowler Off-Road carries essential spares, tools and other supplies for the eight Nemesis vehicles and their teams on this year's rally-raid. In the T5 support role, speed is not as important as endurance and reliability, since the truck must survive not only the abrasive effects of wind-blown sand, but also the boulder-strewn terrain that is such a feature of parts of the special stages in Mauritania and the Western Sahara. This is where the Tatra fully-independent suspension system built around swing axles pivoting off a rigid central tube type chassis comes into its own, as it insulates both driver and load from road shocks and gives exceptional stability and traction at high speed over difficult surfaces. Powered by Tatra's own air-cooled 325 kW V8 diesel engine and with central tyre inflation, this Terrno comes ready for the worst that North Africa can throw at it. Jiři Polman, Tatra’s Chief Sales and Marketing Officer comments, "The market for rally-raid assistance trucks is always going to be a highly specialised one, Tatra’s desire to become officially involved as a prime supplier of assistance vehicles in high profile events like the Dakar and Baja indicates the company's commitment to build the best truck in the off-road heavy-duty truck sector in the world."